Everyone’s doing it lately, from my own newsroom at The Denver Post to The New York Times to individual photojournalists like Doug Strickland: posting the year’s best photos. Given all that inspiration, I figured the time was right to follow suit and try my hand at choosing some of my favorites from my year of shooting. Admittedly, it wasn’t a hugely productive year for me (I’m still sorting through and editing a lot of 2013’s take…), but I made a few pictures I’m pleased with. It’s true, I’m still not over my love of the color a Colorado sunset can bring to the sky. I started the year with an iPhone panorama of a massive cloud formation lit by a January sunset. Not much later, another iPhone photo destined for Twitter showed my film stash. 110, 120, 127, 135, 4×5, Polaroid, Impossible, Instax, and even an unused Kodak Disc crowd the crisper drawer of my refrigerator, filling it right to the top. 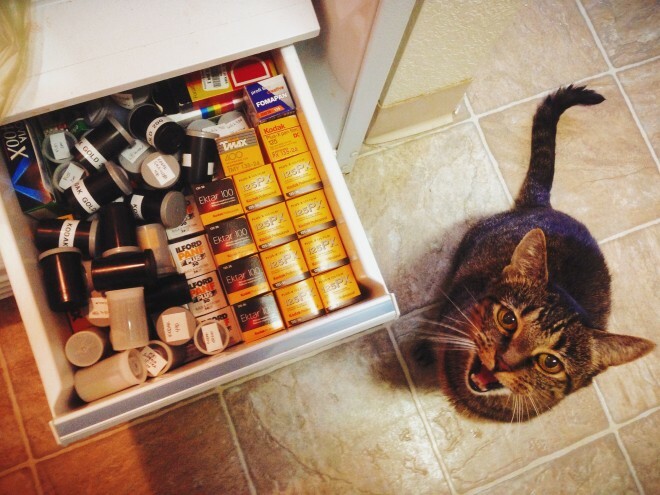 Kate’s cat, Bonnie, thinks there’s too much film. Or is proud of me for collecting it all. Or thinks I should use it faster. Or just wants a bit of cheese (the most likely explanation for her expression). So that was an early experiment with the VSCO app. I haven’t really been using it, though. I’ve got time and money invested in Hipstamatic, and I’m still a pretty big fan of it. Yes, I still buy the new Hipstapaks when they come out most of the time. 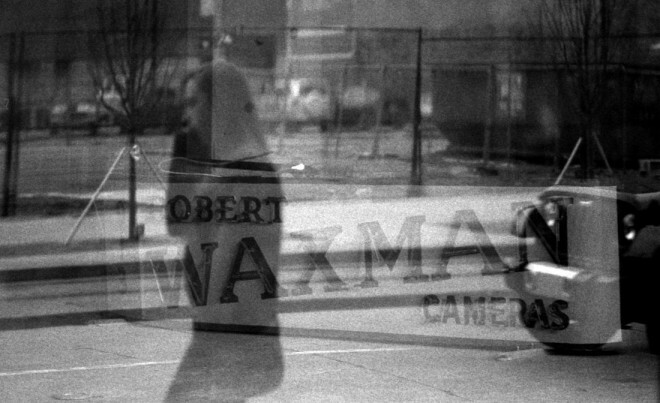 Sometime in early spring I made this picture of the Waxman’s sign (not my first photo of this sign before the space was remodeled and reopened). Robert Waxman’s pawn shop became the home-grown photographic superstore in Denver before it was bought out by Wolf Camera. Wolf has since abandoned the space (and all of Colorado) when parent company Ritz Imaging liquidated its assets in 2012. 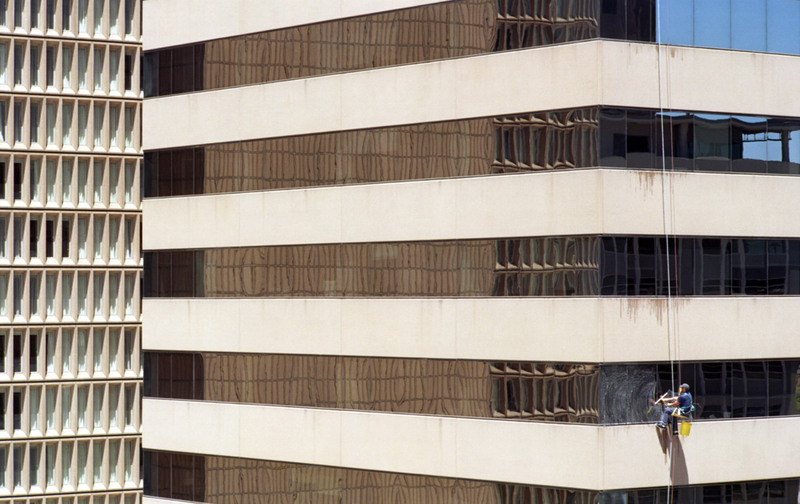 Around the same time, I put a roll through the Voigtlander Bessa I that Santa brought me last Christmas (thanks, Mom!). I’m putting another roll through it now, actually … and still working on making that post. 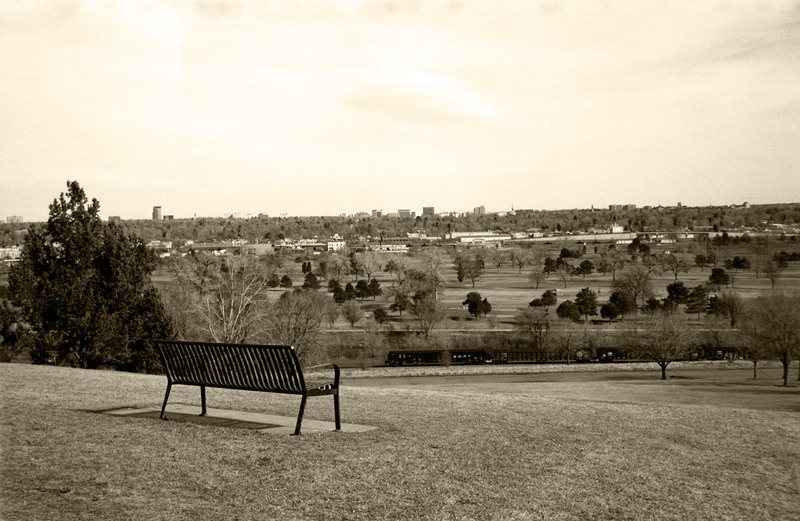 The views from Ruby Hill Park in Denver are impressive. Downtown looms huge and only a mile and a half away, and the eastern slope of the Colorado Piedmont and the South Platte Valley, where southern Denver and the metro area stretch away from the foothills before meeting the plains. Shortly after that my Nikon F2 arrived from KEH Camera. The first body they sent me wouldn’t focus to infinity (the lens would hit the infinity stop when the microprism and split screen on the camera’s focusing screen were still out of focus and appeared to need another 1/4-turn or so from the lens). But I had already loaded it with film and was pounding out a test roll when I discovered this. KEH swapped it for another body with no problem and I started over. But I think the first body they sent really just had an issue with the focusing screen itself, because most of the roll turned out to be in focus, including this shot of a window washer, taken from the roof of the Denver Post building in downtown Denver on a chilly late-winter morning. The second body works great, though, and was totally worth the purchase price. A little later in spring, Kate and I took a drive through the local mountains and poked around Tarryall Reservoir, a small body of water nestled in the low hills on the east side of South Park south of Jefferson, Colo. 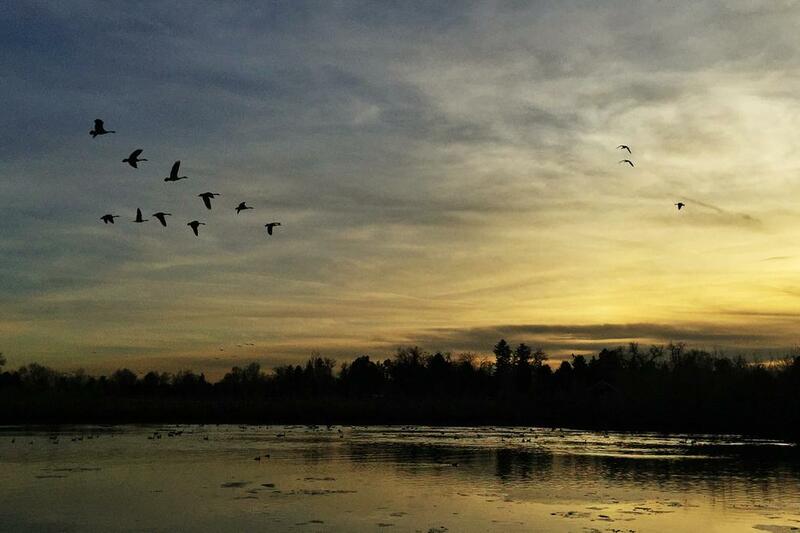 The air was still chilly and the surface of the lake was covered with ducks and, surprising to me, pelicans. I took advantage of some noon storm clouds to silhouette some of the birds against the slightly-choppy water. Maybe this one is more special because it was just a good drive, a good picnic and a good day. In early July, I tagged along for my first group photo walk. Of course I’ve been on personal photo walks before (like, a lot of them, obviously), but I’d actually never done one as a group. Unless you count half a class period stalking around the campus in Photo-J 101. I don’t, really. I don’t remember how I heard about the photo walk, but I thought it couldn’t hurt to watch other photographers working in an area I knew very well. I’d never looked at Trey Ratcliff’s work before, and most of it isn’t, to be honest, all that inspiring to me. But it’s good work, and he puts a lot of time into helping others learn and hone their skills. Anyway, Ratcliff hosted this photo walk, and not knowing his work (or popularity) before I decided to go, I had no idea how large the crowd would be. 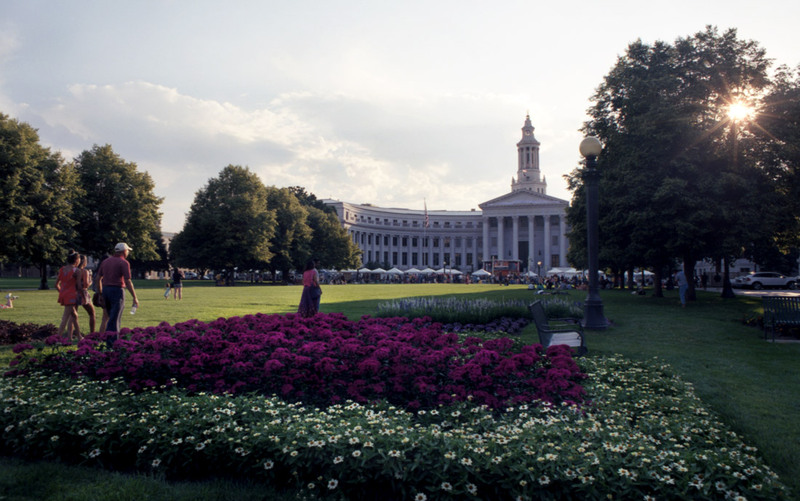 Nevertheless, on a short walk around Civic Center and the Denver Art Museum, Ratcliff made an effort to answer every question asked, and stopped to explain what he was seeing and how he was thinking of making each frame he shot along the way. I’ll admit, I didn’t orbit him like some, but I heard a few snippets of what seemed like good advice, and was impressed with his friendly manner. Afterwards some people stayed behind for drinks at the watering hole that was the meetup point, and I stuck around to thank Ratcliff for his time and chat with a few others in the group. Unsurprisingly, I was the only one in the group shooting film. I’ll post some more frames from the photo walk when they’re all edited. A week or two later, literally hours after finally posting my 2013 UMS photos, I was back at it shooting what I could of Denver’s latest Underground Music Festival. I got some more time in with the flash (although I killed it with some cheap remanufactured batteries that fried something in it — it didn’t charge up, but it got hot enough to discolor the black plastic and burn me before I could get the batteries back out). I also did some more pushing work — shooting Tri-X 400 at 800. You can hardly see a difference shooting it at 800 and shooting it at 200, save for a tiny bit more grain. One of the high points, for me, was shooting the final show of a Denver favorite, Glass Hits. 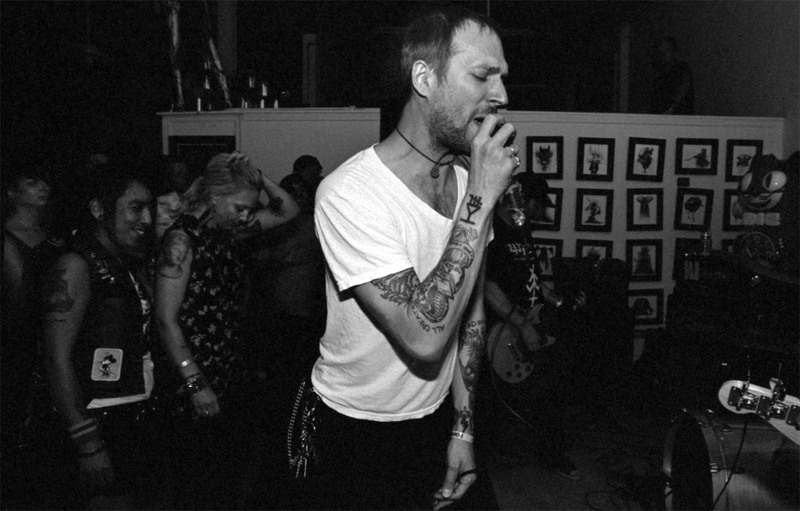 I’d never actually heard of them before, but they have a rabid local following and their gritty, garage punk has just enough polish to scream talent, but a raw energy that’s something like a Minor Threat show in 1982. It was a blast to shoot, though I got shoved around a bit and backed off halfway through the show fearing for my gear. I’ll have the rest of the 2014 UMS photos ready soon, I promise. In August, Kate and I took a trip up to the Lake City area, which I posted some iPhone photos from earlier this year. Here’s the film version of one of those shots. When I’m out exploring a ghost town or forest, I tend to shoot with the film first and the phone second. Writing that makes it sound like some kind of lame excuse, but it’s true. For quick snaps to send my parents or friends, or post on my Facebook page, I’ll just use the phone — especially for those out-the-window-of-the-Jeep shots. But the rest of the time, I’m shooting with the film, and maybe taking an iPhone shot or two of something similar or nearby so I have something to make notes against and which has dates and geographical metadata. So these frames are from those times when I was shooting with film and decided to make an iPhone snapshot as an afterthought. The one above is Whitmore Falls near Hensen, Colo. We hiked from the road down to an overlook, but found that some young aspen (aspen grow fast when there’s water around — like a 1-2 feet per year) were blocking the view. So we hiked down to the falls to explore and photograph. When we’d been down there only a few minutes, another family with some intrepid, but very energetic (read: loud and rambunctious), kids barreled down behind us. 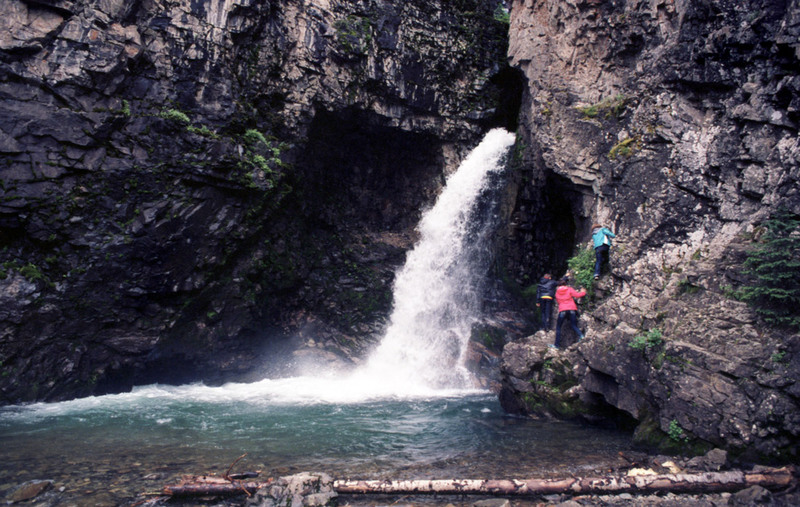 Those kids are the ones fearlessly exploring the slippery rocks beside the waterfall. On the same trip, on the same day, just a few miles further up the road we found Capitol City. Built by the ambitious George S. Lee, who aspired to be Colorado’s governor and move the state capitol to his town in this silver-rich valley, Capitol City was short-lived after Lee changed the name from Galena City. 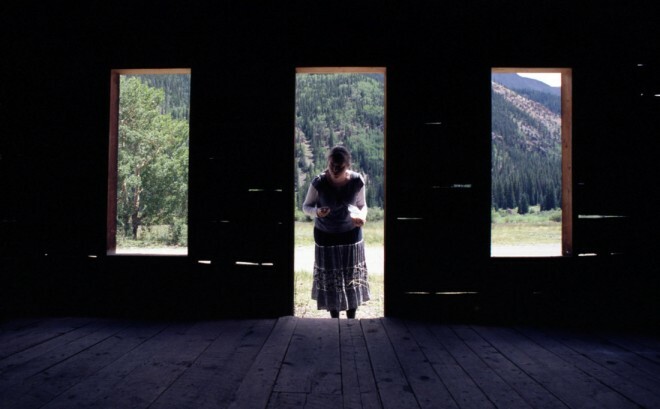 The only visible remains are the chimney of Lee’s brick kiln (he had to make his own bricks to build his grandiose, two-story ‘governor’s mansion’ in the middle of the Rocky Mountains — it’s gone, too) and the partially-restored U.S. Post Office and the bunkhouse behind it. Once again, more from that trip when the edits are done (and/or the rest are developed…). Fitting, then, isn’t it, that I should end the year as I started it. 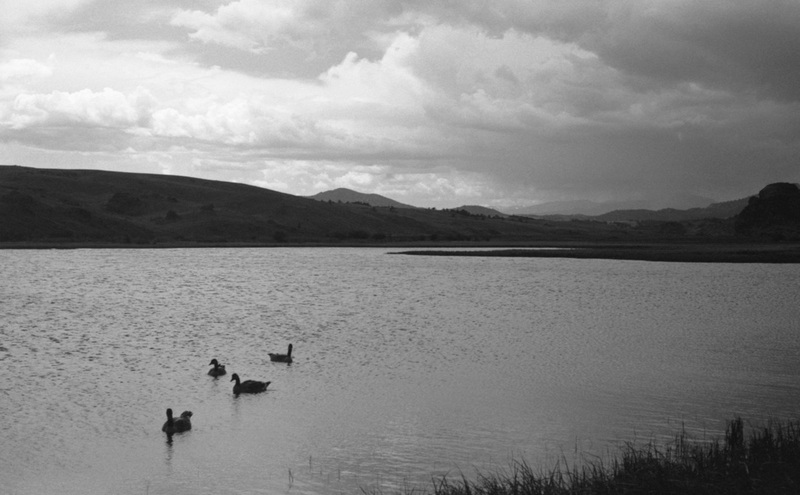 Not long ago, after upgrading to an iPhone 6 (not that big one — I already have an iPad mini, thanks), I took it along on a jaunt to Ketring Lake in Littleton, Colo. I was taking a FED-5c out for a test roll (my second one — a long story I hope soon to tell) and after shooting this scene with film I took a few more with the phone. Call it a test, or say I was seeking a little color since I only had black and white film, but I was happy with the result. Happy new year. See you in 2015, hopefully with more posts than this year.